I suspect expansion would overhang slightly and the sections would be accessible by tunnels. The temporary seats are set up more like Haltons upper level where they are simply set back from tyr lower level with a walkway in between. I for one wpuld be disappointed if expansion is set up this way, but it is still better than no upper level. Glad they’re GREEN and hope they’re sturdy. I didn’t mean it to that literal of a point lol. Just that we will have over 20k there, some on higher ground, using restrooms and concessions. Good time to gauge how all things are running and how the atmosphere can be. We really need to expand soon! AD said at Wilson’s World this morning that temp seats are staying up all season. Great to hear! I’ve posted above and on IG that we should keep it up all season. Not only seems like a no brainier business wise, but aesthetically too! I also feel like this is a test run for Niner Nation in Hill’s eyes. We need to give our full support to this football team not just for the first 3 games, but every home game. Expansion is inevitable, however, our support/attendance will just reinforce/justify the need and hopefully expedite the process. clt says hi mike hill! Did he mention his plan to put butts in those seats? “AD” in the general / non-Mike sense, and no, this person didn’t say. Odds are we aren’t going to be that good and demand won’t really be there, but that doesn’t mean we can’t use this as a promotional aspect and give away tickets to local organizations, businesses, etc and just try to get folks in the door to let them experience/see what Hill wants to build upon. Exactly what I was thinking as well. Once we expand, I would like to go the Tepper route and have more events in the stadium. I think moving or rotating the High school Kickoff games (that are usually at Memorial Stadium) to JRS would be cool and good exposure. Host the State championship would be good too. Concerts, a lot of stuff…15K limits us in more ways than one. 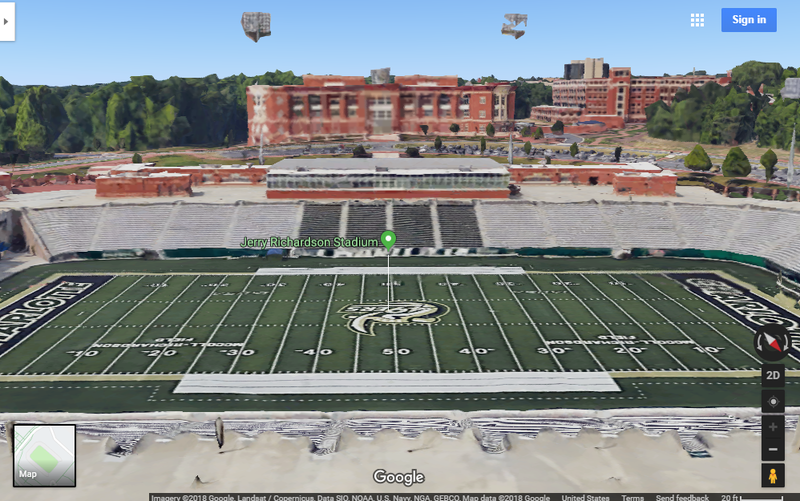 *Does anyone know if you can see the temp seats from Tryon (driving by)? I like my FSL seats but I wouldn’t mind sitting in the temporary seats later in the season instead of sitting in the cold shade on the alumni side. Plus I could see the entire field sitting higher up. clt asks at what point do the seats become permanent and not temp? I don’t think so, and you’d have to look quickly if it was possible. I’ll be visiting that side tomorrow during the game at some point. Those are probably the best seats in the house once teh sun goes down. You can see the top few rows if you look at just the right time. It’s a rough image from Google Earth, but it’s going to be a fantastic view of not only the field but the campus too! That was my thoughts as well. Better to give those seats away than leave them empty. At least we could generate revenue off of concession and some merchandise. And maybe, just maybe gain a few regular ticket holders.